In fact this species schould be named in full Rivulus uroflammeus siegfriedi as this was the original name given by Bussing in 1980. It was described at the same time as Rivulus uroflammeus uroflammeus by Bussing and must be seen as subspecies to this taxon. Both species live on different altitudes and R. u. siegfriedi differs by the red on its peduncle that is not fused into a closed patch versus forming a fused red peduncle in R. u. uroflammeus. It was discovered by Bill Busing, Peter Siegfried, Savage and Lieb on 21 July 1974. Bussing named the species to honor the co- discover Peter Siegfried. The type locality is a tributary to the Rio Térraba, 3.6 Km south of Palma Northe, Puntarrenas Prov. Costa Rica. Rivulus (Cynodonichthys) siegfriedi - male. (Palma Norte) © Image made by F. Vermeulen. 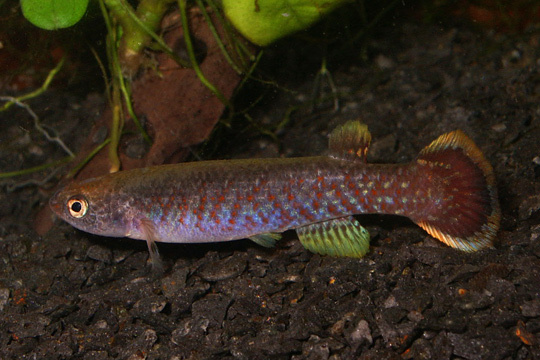 Rivulus (Cynodonichthys) siegfriedi - female. (Palma Norte) © Image by F. Vermeulen. Keeping and breeding is easy but a good cover of the aquarium is necessary because there ability to jump, even true the smallest opening, is unbelievable. 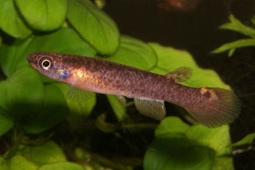 This species can, if there is enough space for them, housed in a tank with more males than one only and several females. If separated before and brought together again however, they can be very agressive to each other and fight to become dominant to others. The best way to have much offspring is to put a pair or an trio in a small tank from 10 liters with a small filter in it or with some airation. On the bottom some peat moss or dark gravel and a floating "mop" to give space for laying there eggs. The fish will, if they become a rich varity of life food, spawn during there whole adult life and produce daily between 5 to 15 eggs. The eggs should be collected by hand and stored for about 14 days in a small container. Eggs are 1.6 mm and amber colored. It is wise, to add to the water you store the eggs in, some acryflavine to provent fungus coming up. After hatching the young fry can eat fresh artemia nauplii without any problem. It takes 4 to 5 months to raise them to maturity. Often the number of males is far above the number of females. For some species this can become a major problem for the breeder as he has to raise many young fishes and so become able to distribute a few pairs to other hobbyists. Recent personal tests laerned that lower pH levels during the time of hatching gave a higher percentage of females. To achieve this I use some peat moss that I add to the container with the egss just before they are ready to hatch. This peat moss also is a good way to prevent eggs to become attact by fungusses. There lifespan can be up to 3 years in captivity. Bussing, W.A. 1980. Status of the Cyprinodontid Fish Genus Rivulus in Costa Rica with Descriptions of new endemic Species. Brenesia, San Jose, 17: 340, figs. 2C, 5C, 6C.